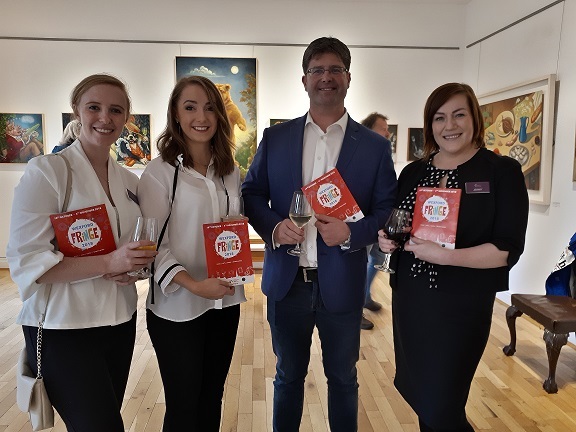 Over 60 of Wexford’s culture vultures were out in force at the launch of Wexford Fringe last Wednesday 12th September at Green Acres Art Gallery, to celebrate the unveiling of the 2018 Fringe Guide. The event marks the beginning of the Festival season in the town as it begins to count down to the 67th Wexford Festival Opera which, along with the Wexford Fringe, starts on October 19th. Niall thanked James O’Connor and all at Green Acres for their continued sponsorship of the Fringe Launch and for the excellent hospitality they extended to guests at the launch. Paying special tribute to all those involved in the design and publication of the guide, Niall thanked Think Print for designing and printing the guide, Róisín O’Neill and Lauren Scully for co-ordinating the guide, Denise Farrell for organising the launch night and the many advertisers. Given the honour of opening this year’s Fringe Festival was Mayor of Wexford, Cllr. Tony Dempsey. He said, “Over 300 Fringe events literally engulf Wexford town over 17 days and encompasses an incredibly diverse array of creative activity to include drama, musicals, literature, visual art, opera, Singing & Swinging Pubs, Spiegeltent Festival and much more. “ He paid tribute to the people of Wexford, the volunteers, the advertisers, those in business and those in arts and crafts who have ensured that we are hugely successful in presenting our festival on a worldwide stage. The Mayor thanked Wexford County Council who is tremendously supportive of the arts and congratulated Wexford Chamber for driving this project, making Wexford a destination for people with so many interests. In closing, the Mayor encouraged everyone to join in and to enjoy all of the cultural experiences on offer.